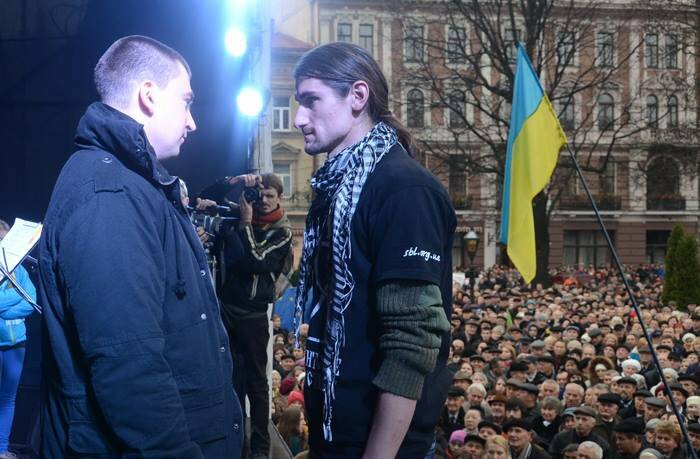 How do we (and Ukrainians) make sense of what is happening in Ukraine? 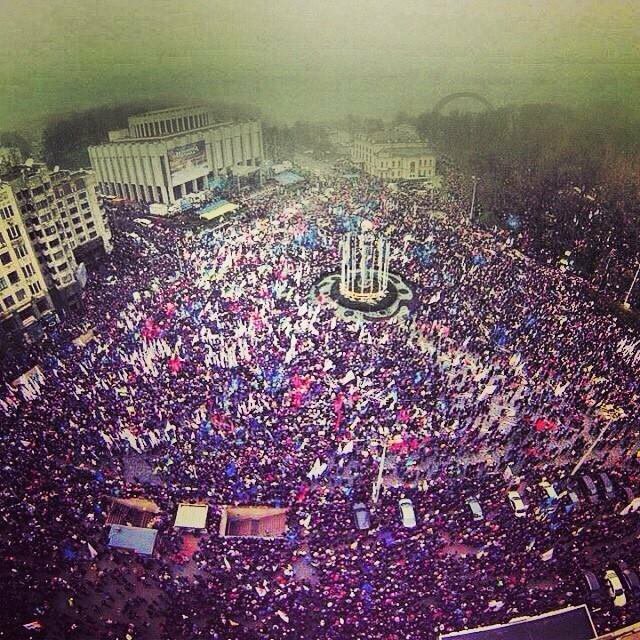 Is the hashtag #euromaidan of any help in understanding Ukraine's choice between the EU and Russia? In general, I don’t like using the flag of the European Union as a protest symbol, just as I don’t like using the ‘Ode to Joy,’ the phrase ‘European integration’ or the hashtag #euromaidan, despite the fact that I’ve already used the latter myself several hundred times. I don’t like them because, for me, they do not evoke any emotions; in the same way that the official symbols of the IMF, UN, OSCE or the EBRD say nothing to me. In general, I don’t like using the flag of the European Union as a protest symbol, just as I don’t like using the ‘Ode to Joy,’ the phrase ‘European integration’ or the hashtag #euromaidan, despite the fact that I’ve already used the latter myself several hundred times. I don’t like them because, for me, they do not evoke any emotions; in the same way that the official symbols of the IMF, UN, OSCE or the EBRD say nothing to me. I don’t like them because, in contrast to our national flags and hand-painted posters, they were invented or chosen by men in suits. That is why I can’t force myself to use the symbol of the European currency as my profile picture. What does the euro have to do with anything here? Panoramic view of Kyiv's 'Maidan Nezalezhnosti' or 'Independence square.' Since the so-called Orange Revolution of 2004 the word 'Maidan' has become a shorthand for political protest throughout the Russian-speaking world. At the same time, I realise that talking about these symbols without context is pedantry. 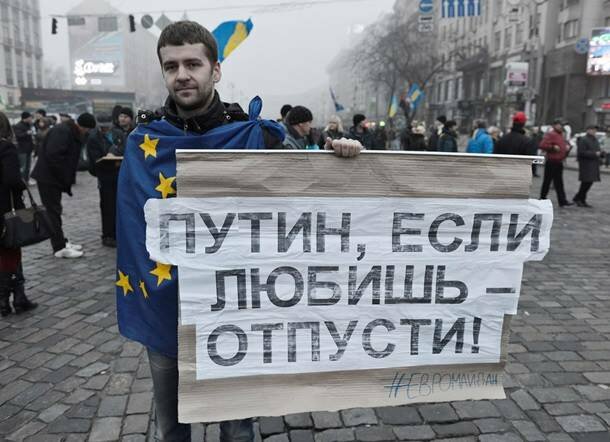 For us at #euromaidan, the word ‘Euro’ doesn’t mean the European Commission, or cabinet meetings in Brussels, or the currency, or Baroness Ashton, or the bureaucrats. Here’s the thing: if you don’t explain to Ukrainians what is inherent in the concept of the ‘euro,’ from abroad the protests about European integration might look strange, but then, we didn’t understand why the Turks got so angry about the construction of a tiny park, or why millions of Brazilians are so ready to crawl under batons and bayonets because of a rise in the price of bus tickets. Caught up in the protests, I really do not have the time to respond to reports from Western journalists who, exactly as they did in 2004, are asking about Ukraine’s choice between Russia and the EU. What can I say? Perhaps it is logical to assume that it is not the European Union that the Ukrainian people support, but rather European values (including material values). However, I don’t believe that anything like specifically ‘European values’ exist, just as there is no such thing as ‘European’ human rights. They are just human rights, which should be universal from Tokyo to Rio, New York to New Delhi. Moreover, if you look not at the letter of #euromaidan but rather at its spirit, the euro itself is secondary, that’s why it is so hard to find appropriate responses to the protests. After all, it’s not a question of making a ‘geopolitical choice’ in a strictly literal sense – neither supporting the EU nor expressing anti-Russian sentiments – but rather the universal right of citizens to take to the streets when their opinions are brazenly disregarded, even though, supposedly, 'the people are the source of power.' Ukrainians must do the same as the citizens of Turkey, Brazil, Egypt and the USA did, speaking of values, which are common to all people. Abandoning the ‘Euro-choice’ in Ukraine means remaining in the territory of lawlessness and tyranny, ignorance and kleptocracy. Abandoning the ‘Euro-choice’ in Ukraine means being stuck in a grey zone where education and professionalism are empty words, where being different risks earning you a kick in the head. Abandoning it right now means finding ourselves on the brink; and we risk falling into an abyss where every day would be like this: Vradiivka and Indylo – a village in the south of Ukraine where local policemen raped and beat up a girl; and a 20-year old student died after being tortured at a police station. Where ‘education’ means Tabachnyk and Farion – a Minister of Education who denies that western Ukrainians are really Ukrainian, and is trying to ‘Sovietise’ Ukrainian historiography; and a neo-Nazi MP, former communist party member and school teacher who claims those who do not speak Ukrainian ought to be jailed. Where ‘healthcare’ means Slyusarchuk and a drug called ‘Ukraine;’ and a distinguished neurosurgeon who turned out to be a fake, and in the end was accused of forgery, fraud and illegal medical practice which led to the deaths and injuries of patients; and a fake anti-cancer drug sold by a political party which led to the death of the patients. Where ‘art’ means Zabolotna’s black square – a mural critical of the government, which was painted black by the curator of a modern art exhibition in an act of wanton censorship. Abandoning the ‘Euro-choice’ in Ukraine means remaining in the territory of lawlessness and tyranny, ignorance and kleptocracy. That is why this time, unlike 2004, the presence of journalists on the streets does not raise any questions, because the EU flag no longer represents a choice between the EU and Russia, where there is a compelling argument ‘for’ or ‘against’; rather, it is a revolt against everything which journalism should be exposing, but has become a routine. That is why the slogan ‘death to our enemies’ grates on the #euromaidan, like the presence of those pseudo-politicians who have not yet realised that the protests of ‘the opposition against the government’ were left behind last century. That is why I don’t care what those pseudo-politicians say because victory for the #euromaidan does not mean taking political power, but rather changing the rules. That is why they cannot substitute the popular chant of ‘Shame!’ with ‘Schen-gen!” – even though at our western border, a wall is still standing that has become the Wailing Wall for non-Schengen Ukrainians. A protestor holds a sign (in Russian): 'Putin, if you love something - set it free!' Although framed in geopolitical terms as a battle between the EU and Russia, Ukraine's protests might be better viewed as protests against domestic lawlessness, corruption and arbitrariness. Of course there will always be someone who says that mass demonstrations have no impact, citing those mass protests that have swept the world but were not always effective, but it seems that the demonstrations alone – which in Ukraine had systematically been discredited by all parties bribing the participants – have come back to life. During the year I spent in the Arab world, Turkey, Greece, Brazil and the US, talking with community activists, politicians, theorists and sociologists who study protest movements, I came to the conclusion that Ukrainians don’t have many reasons to be disappointed with the initial failure of the civil demonstrations, which should not be confused with the systemic defence of the people’s own rights. The principles of success are simple: organisation, resourcefulness, perseverance and time. I came to the #euromaidan from Beirut, from where I returned in a very tranquil state, because there is no reason for despair and despondency. Simply, there are more reasons to work harder now. In Beirut, I spoke with young Syrians: DJs, broadcasters, musicians, with whom we share common, human values. They left Syria not because the country is a wreck (which it is), but because they do not have the option of not fighting and not killing (because of military conscription). For more than two years they have experienced horrors, which are impossible to imagine. You might say there is no point in making comparisons with those who turned out to be in an even worse state, but that’s not the point. Quite simply, a lot of them have found a way to hold on, not to be depressed, not to say ‘all is lost.’ They know that ‘whether you want it or not, you can’t suddenly get rid of universal injustice’, but they have found a simple way: everyone has to do their job, which even though it may not amount to much, changes things around them, without despair and without despondency. Last Thursday, a day when, after all the commitments and five years of negotiations, the government announced it was breaking off the EU Agreement talks, we were a bit nervous, as we planned to launch our online public broadcasting TV channel Hromadske.tv for the first time; it was supposed to have gone on air a week later, but it began the very next day. Not to support ‘Euro-integration’, but to support civil integration. A week ago, the most popular Facebook comments were ‘let’s emigrate’, as well as complaints about the pervasive cynicism. Today, some friends are arranging ‘CinemaMaidans’ on the city squares, and gathering signatures for a ‘personal association;’ instead of talking loudly about the crisis of the EU, they are charting an alternative course; and instead of getting angry on Facebook that right-wingers want to steal their protest, they are organising a students’ strike and a ‘Sounds of Maidan’ campaign, just as students in Lviv turned off the microphone in front of an ultra-nationalist MP. This has nothing to do with Euro-integration. I still dislike the official flag of the EU, as opposed to, say, a Guy Fawkes mask; yet it seems that Ukrainians are bringing some humanity to #euromaidan.